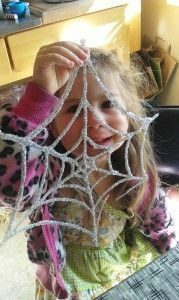 Do your kids like doing crafts? 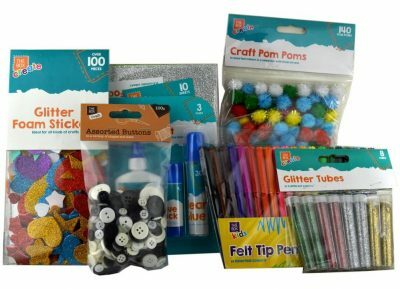 We have made some cool craft boxes plus scroll down for craft ideas. 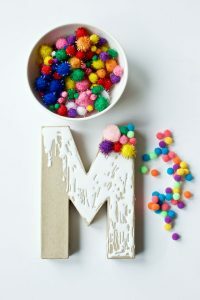 How about making large letters for their initials and decorating them with pom poms? They make good room decorations. Cut out some letters from an Approved Food box using scissors, cover with glue and coat with pom poms. Leave to dry before moving. Great as a puppet or to stick onto cards. 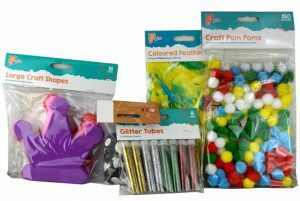 You will need some card, scissors, glue, glitter, feathers and googly eyes. Cut out the body and beak of the bird from the card. 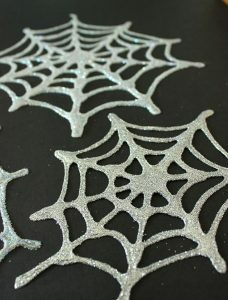 Cover the body with glue then glitter and leave to dry. When dry, stick the eyes and beak onto the body. Turn the body around and glue on some feathers to make the tail. If you want to make a puppet glue a stick onto the back. You can do any design you like. You will need paper, a pencil, glue and glitter. Use a sheet of paper and draw a design. Draw over the design using the glue, make sure it is thick. Scatter the glitter all over till the glue is covered up. Tap the excess glitter off. Repeat if some areas are not covered with glitter. Leave to dry and peel off carefully. Great way to spice up their stationary. You will need feathers, tape and a pencil or pen. 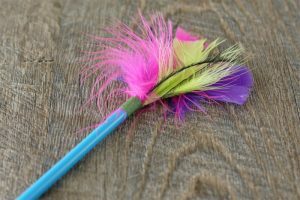 Gather some feathers and tape the feathers to the top of a pencil or pen. 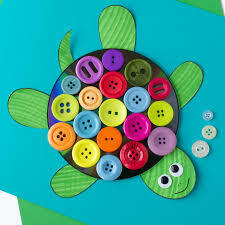 You will need a cup, balloon, glue and buttons. Blow up a balloon, the size will determine the size of your bowl. Stand the balloon in a cup. Cover the top with glue and place the buttons on top. Leave till completely dry. 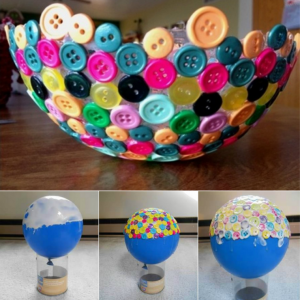 Place the bowl button side down on a table and pop the balloon carefully. Great to store the kid’s little toys, their jewellery or hair essentials. Great for the little ones. You will need paper, glue and glitter. Cover their hands with glue and press hard onto the paper. 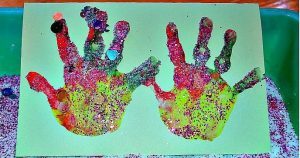 Scatter the glitter onto the paper, mix and match colours if you like. Tap the paper to remove any excess glitter and leave to dry. This makes a cute little jewellery box. 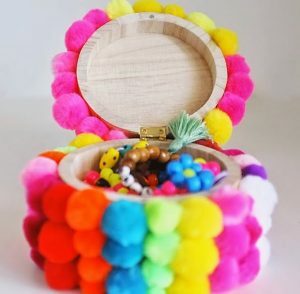 You will need a small wooden box, glue and pom poms. Place a blob of glue on to the box and cover with a pom pom. Repeat till the whole box is covered. Make sure to add enough glue. You will need pinecones, feathers, googly eyes, coloured paper, a stick and 2 pasta shapes. 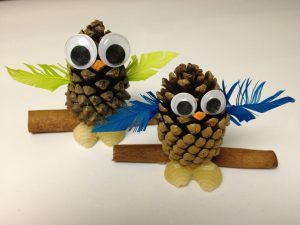 Dip the feathers into some glue and stick onto the pinecone. Glue the back of the eyes and stick them on. Cut out a nose from some coloured paper and stick it on with glue. Glue the base of the pinecone and stick on the stick, this may need lots of glue and a bit of pressure. Glue the two pasta shape to make feet. Leave to dry. You will need some string and buttons. Cut a piece of string long enough for their neck. Thread the buttons onto the string and tie a knot. 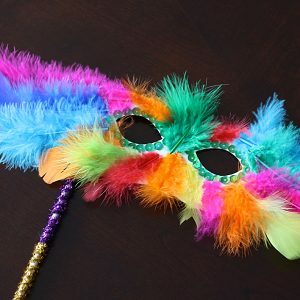 You will need card, scissors, glue, feathers, glitter, stick and tape. Draw a mask shape onto some card and cut it out. 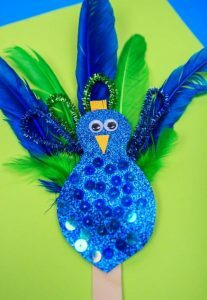 Decorate with glitter near the eyes and add feathers. When dry attach a stick to one side using tape to act as a handle. You will need coloured paper, an old CD, glue and googly eyes. Cut out the design of the animal you wish to use. Glue the CD to the paper (you may need strong glue for this) and leave it to dry. Cover the CD with glue and stick the buttons on top. Add googly eyes and any other features you need with felt tips. Spice up a photo frame with pom poms. You will need a photo frame, pom poms, glue. 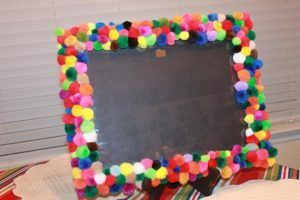 Glue the outer frame and cover with pom poms. Leave to dry. 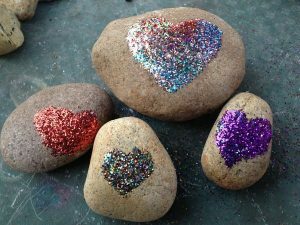 You will need pebbles, glue and glitter. Draw the design using a pencil, fill in the pencil with glue and pour on the glitter. Tap the glitter off and leave to dry. How cute are these? Great for a teddy bear tea party. You will need sponges, scissors, glue, glitter, foam stickers, pom poms. 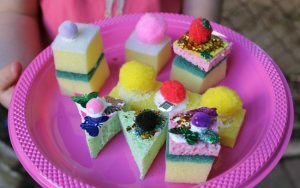 Cut up the sponges into cake shapes. Stack different types of sponges on top of each other to make a layered cake. Top with glitter, foam stickers and pom poms.